The above image is a drawing "Croydon from the South East" by Samuel Maynard Kirkman in August 1906. It is part of a collection of drawings by Kirkman, many of which are of Croydon, added by Seif El Rashidi. Margaret Chan's wonderful records about Croydon's transport. Margaret recently explained to us that Croydon has a long history has a transport hub and even now "many of us who live here do so because we want to go somewhere else!" Margaret's records are accompanied by wonderful images that bring this aspect of Croydon's history to life. One of our newest collections that promises to grow and grow - the people, stories and history of Whitgift School in Croydon from its opening in 1600 to the present day. Added by William Wood. Taking local history to its local-est extremes, Cathy Aitchison has added several records all about Broad Green, a small neighbourhood within the borough of Croydon. Her photographs show us how dramatically the area has changed in just the past few years. To see what Croydon looked like more than half a century ago, have a look at our mid 20th century OS map layer. Many of the sadly gone landmarks that Cathy Aitchison describes in her Broad Green collection are marked on the map along with countless other public institutions that served the community over the years. 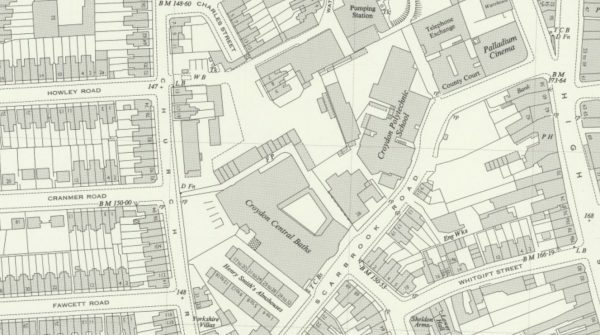 We hope to soon add more historic maps of Croydon so that you can peel back the layers and see how this dynamic area has changed. Looking ahead, the Croydon archives are planning to showcase some of the fascinating items they hold in a new collection on Layers of London and we will be returning down south for more community hub sessions. We can't wait to learn more about the captivating history of this part of London.